Now that I've built the Mark 3, how well does it work? How fast can it go? How much efficiency does it provide? This is my engineer's notebook about the Mark 3's performance. 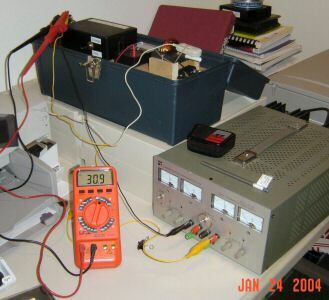 My goal is to measure the performance of several projectiles at different voltages. This provides hints about what direction to make changes. Keep in mind: my basic goal with all my coilguns is to improve efficiency, not speed. I assume that I can always scale it up larger at some later date. I used acoustic speed measurements, using a cheap microphone and the sound card in my PC. This was surprisingly easy and accurate! Measurements are in red. Computed values are in blue. Voltage - 'V' was set on an adjustable power supply which charged the capacitors. Capacitance - 'C' is two capacitors with a sum total of 24,000 uF. Distance to target - 'd' will vary to accomodate various launch speeds. Time - 't' was measured by Cooledit 96 waveforms using a microphone mounted on the launch tube. It sure was fun to launch at speeds over 10 m/s! This is the fastest I've ever gone. My acoustic enhancement target was sheets of newspaper hung from the edge of a small portable table. It makes a very satisfying noise which is easily detected by the microphone. The efficiency peaked at 6.8% and 12v. I am still wondering if it would be better or worse with other sizes of projectiles. This needs more simulation and measurements to see what theory predicts, and how well it matches practice. The efficiency curve is not smooth -- it is very sensitive to the starting position.